We're set to go but need $15,000 to pay for our first bulk order. We'll be wearing giant baby costumes in all our own time (on the commute to work, the supermarket, childcare drop off, you name it...!) until we reach our goal (or the four weeks is up). Please help us reach our target soon!! In the first 1000 days of a child's life (from conception to Age 2) their brain will develop more rapidly than at any time. 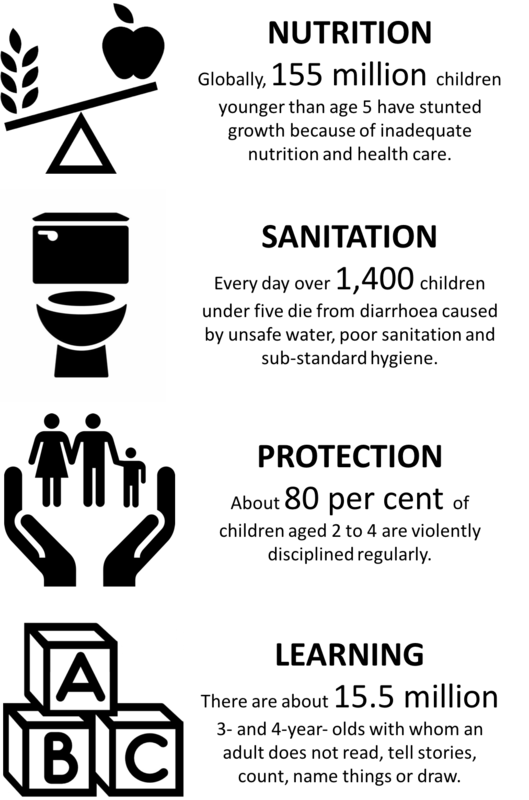 At this age, it is critical they have access to adequate sanitation, nutrition, learning opportunities and protection from harm - these seemingly simple things can change the course of a child's life and even break the cycle of poverty (1,2,3). But it's a sad truth that millions of babies worldwide don't have access to these and that one of the biggest barriers to tackling this is lack of funding (2). We've set up Good Bubs with the main purpose of supporting existing early childhood programs to create lasting change for babies and children, now and throughout the course of their lives. Our baby blankets and burp cloths have been designed in Australia with the help of many mums and dads who generously shared their ideas with us. They are made from naturally sustainable and pesticide-free bamboo, are lightweight and so great for the Australian climate, and are super-soft, super-snuggly, super-breathable and just darn cute. Below are the two final designs that are prepped and ready to be produced as well as roughly what they will look like in the packaging. We believe that everyone can make the world a better place by making conscious decisions about the products they buy and who they buy them from. The world is changing and businesses need to keep up! 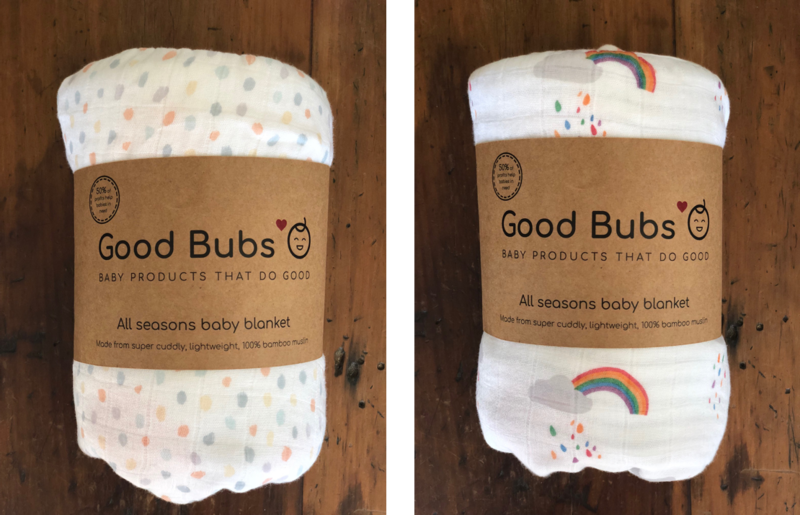 We believe that to make a meaningful difference to the charities we support, Good Bubs needs a sustainable business model. That's why we plan to donate 50% of profits to charity, leaving the remaining 50% available to develop our products, our business and our people. We're talking with a number of great charities (big and small) who are already delivering positive outcomes for disadvantaged babies and children in Australia and around the world. Our team has considerable experience in the charity sector and particularly in measuring program outcomes and impact. We plan to make our donations based on a skilled assessment of where we think the funds are most needed and where they will have the biggest impact. We hope you are as excited about our project as we are and we'd love you to check out our rewards. Whether you support us today or not, you can chat with us or keep up to date with what we're doing on facebook, instagram or by visiting our website. Let's do good together! Child Health, Murdoch Children’s Research Institute. 2. Britto, P.R. (2017). Early Moments Matter for Every Child. New York, USA: UNICEF. We've already put out money where our mouths are... We've spent the last 8 months doing consumer research (having awesome chats with lots of mums and dads! ), designing our products, developing our business model, choosing a supplier and perfecting our samples. We've also conducted an audit of our supplier to ensure our products are being made ethically. $15,000 is the amount we need to pay for our first bulk order, shipping and taxes. If we reach our stretch goal, we'll increase our first order so we can make more sales to help more bubs in need. We'll also invest in more marketing to get our products out there and more infrastructure to make our business more sustainable. Some MASSIVE Good Bubs Good Vibes heading your way! Your donation shows us that you believe in this project and gets us that bit closer to realising our dream. And we'll add you to the honour roll on our website as a founding donor! 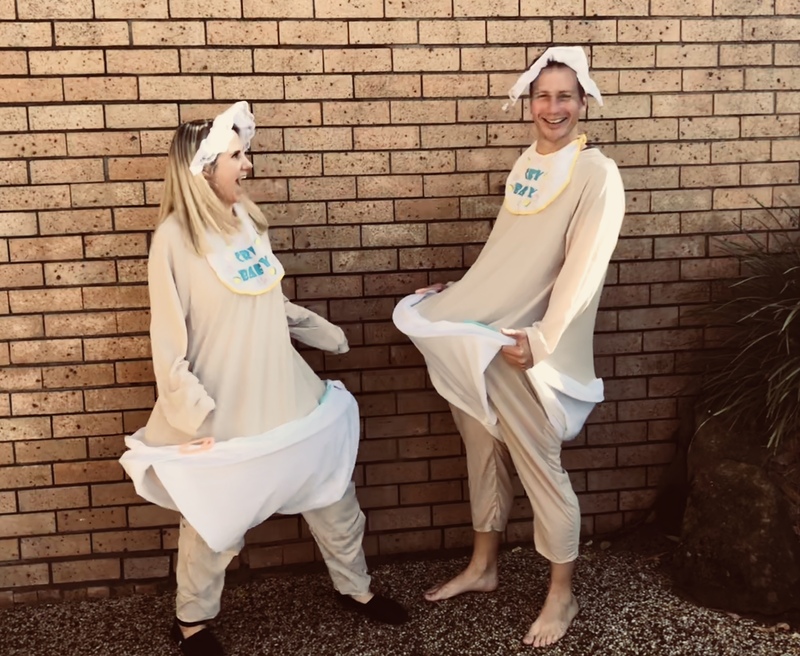 Be one of the first to get your hands on our bamboo burp cloth twin pack for only $30, including delivery to anywhere in Australia! (For international deliveries, please add an extra $20.) And we'll add you to the honour roll on our website as a founding donor! Our burp cloths are made from super soft, lightweight and breathable bamboo muslin. Their rectangular shape makes them perfect for throwing over the shoulder while burping bub, and their handy size means they easily fit in a pocket or nappy bag to mop up spills while out and about. Each burp cloth measures 50cm x 20cm. Delivery expected Nov/Dec 2018. Be one of the first to get your hands on our bamboo baby blanket for only $60, including delivery to anywhere in Australia! (For international deliveries, please add an extra $20.) And we'll add you to the honour roll on our website as a founding donor! Our baby blanket is made from lightweight, breathable and super cuddly bamboo muslin. It is incredibly versatile - use as a blanket, a wrap or a nursing cover, to mop up spills, create shade or provide a clean place to lay down your baby. The lightweight design is great for summer, while its generous size means it can be doubled over to keep bub toasty in winter. Measures 100cm x 100cm. Delivery expected Nov/Dec 2018. The ultimate bamboo baby package - get your hands on both our bamboo baby blanket AND burp cloth twin pack for only $75, including delivery to anywhere in Australia! (For international deliveries, please add an extra $20.) And we'll add you to the honour roll on our website as a founding donor! Delivery expected Nov/Dec 2018. For $150, we'll send you one of our super cuddly, lightweight and breathable bamboo baby blankets, embroidered with your chosen name (max 10 characters). Includes delivery to anywhere in Australia. (For international deliveries, please add an extra $20.) And we'll add you to the honour roll on our website as a founding donor! Delivery expected Nov/Dec 2018. For $150, we will send you one of our super cuddly, lightweight and breathable bamboo baby blankets, embroidered with your chosen name (max 10 characters). Includes delivery to anywhere in Australia. (For international deliveries, please add an extra $20.) And we'll add you to the honour roll on our website as a founding donor! Delivery expected Nov/Dec 2018. Your donation will be used to supply blankets and/or burp cloths directly to one of our partner charities ($250 minimum or choose a different value above that amount). You'll also receive a certificate in recognition of your support, a shout out on facebook and instagram and we'll add your to our honour roll on our website as a founding donor! Ideal for donors or businesses who want to make a bigger difference. If you'd like to give more than this, contact [email protected] to discuss other opportunities. Pre-order stock at wholesale prices to sell in your own store (minimum $500 or choose a different value above that amount). You can spend this however you like. Contact [email protected] for more details.